Chronic infection of a prosthetic mesh implant is a severe complication of ventral hernia repair, and mesh explantation is usually required in these cases. Biologic mesh implants have a possible role in ventral hernia repair in this setting. 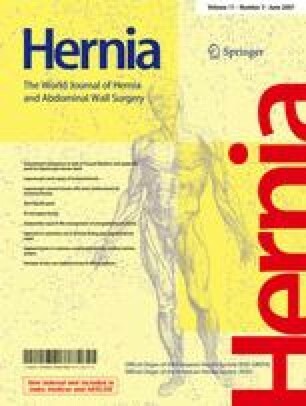 Here we present a case of chronic mesh infection following ventral hernia repair and the use of a biologic mesh to repair the existing defect following explantation of the infected mesh. Analysis of the explant material demonstrated possible oxidative degradation of the original polypropylene. A review of the literature follows. This research was supported in part by a National Science Foundation Graduate Research Fellowship and funding from the University of Missouri-Columbia Food for the twenty-first Century (F21C) grant.